If you want to work with infants, online child care provider training can help you get the knowledge and credentials you need. Similarly, if you need to earn or renew your Child Development Associate credential and you want to enhance your knowledge of infants, you should consider taking online courses related to infants’ emotional and social development. In both cases, we have the online child care provider training that you need at ProSolutions Training. When you work as a child care provider for infants, you are with these young children during one of the most important points of their development. The brain grows more in the first year of life than it does at any other time. In fact, during this stage, babies are gaining 250,000 new neurons every minute which helps them create memories and learn new things. 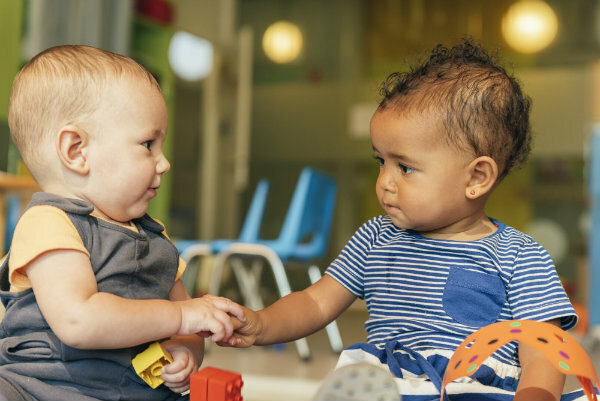 Finding ways to promote the social and emotional development of the infants in your care will help make the most of this important time in their lives. One way to do this is through exploration. Open exploration is essential to infant development. Take infants into new settings in a variety of weather conditions at different times of the year. Even a simple walk to the park can be stimulating for an infant. It’s also important to provide opportunities for them to explore with different colors, materials, and textures in the classroom as well. While you're exploring, remember to have fun. Laughing and smiling with your very young students is important. It models positive social interactions and relationships between the child and their caregiver. This sets a foundation for the infant's future emotional growth. At ProSolutions Training, the course “Social and Emotional Development in Infants” will explain different stages and events to expect as infants grow socially and emotionally. The course discusses various milestones that occur during this phase, along with information about attachment, stranger anxiety, infant temperaments, and other emotions that may start to surface. In addition, the course “Activities That Promote Social and Emotional Development in Infants” will share ideas and activities that will foster this development in infants. In this course, you will explore four major areas related to social and emotional development, beginning at infancy through 18 months. Both of these courses are just an hour long, and provide you with 0.10 continuing education credits toward earning your CDA or your CDA renewal. Additionally, if you eventually plan to work with older children, you should look at online child care provider training courses on emotional and social development for toddlers and preschoolers. Armed with that information, you will be able to nurture a developing child from infancy through the start of Kindergarten! Being an educator can be a lot of fun, and having an educational foundation first helps prepare teachers for the task. That's where we come in. At ProSolutions Training, we offer all the courses you need to earn or renew your CDA. To learn more, take a look through our course catalog or sign up for some of your child care provider training courses today.